Click the image to see Magnificent Mind on Amazon.com. When we pay attention to our health we consider our hearts and muscles and so forth – so why not include our brains? 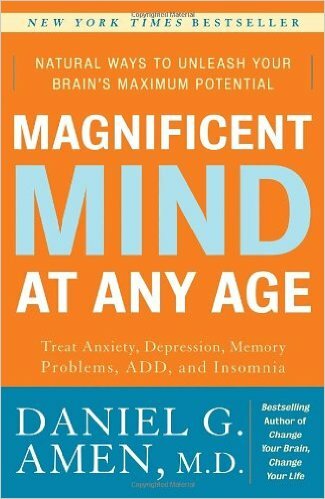 Magnificent Mind At Any Age: Treat Anxiety, Depression, Memory Problems, ADD, and Insomnia by Daniel G. Amen, MD challenges us to look at our brains as something we can take care of and keep healthy – which leads to a magnificent mind. In Magnificent Mind, Dr. Amen suggests that modern medicine is here to assist us in improving our minds and he gives strategies and advice to treat many given medical diagnoses. When we begin to see that our anxiety, depression, memory problems, attention deficit disorder (ADD), or sleeping difficulties are related to the health of our brain and there is something we can do to help ourselves – that is empowering! That seems like something both Dr. Amen and I have in common: we want to empower you to be the best you can be and not feel confused in the face of the modern medical system. Some doctors and researchers have criticized Dr. Amen’s writing by calling it a “simplistic overview” of the complicated intricacies of the brain. I disagree. 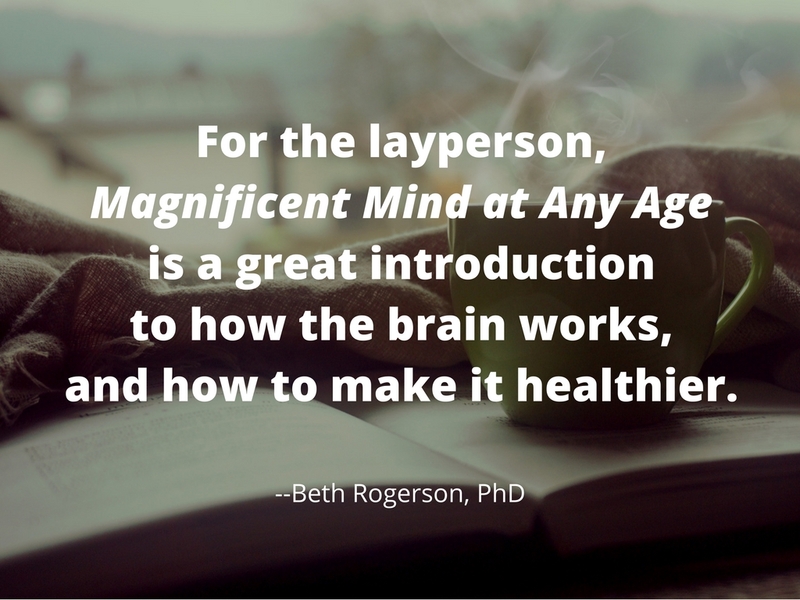 For the layperson, Magnificent Mind at Any Age is a great introduction to how the brain works, and how to make it healthier. Magnificent Mind pulls together information gleaned from a lifetime of work into protocols for specific diagnoses that include dietary changes, exercise, natural supplements, and positive reinforcement, as well as prescription medication and talk therapy to repair the affected parts of our brain. Dr. Amen has written many books for the layperson to better understand their own brains over the last twenty years. He has also built clinics which will take a “picture” of your brain using SPECT imaging and then base their treatment plan on what they see happening. The SPECT image can show where blood is not flowing in a healthy way. Although it would be fun to get a picture of my brain I really don’t need it. I know when it isn’t acting like I want it to act. When I continually lose my keys, get lost in the woods, can’t remember my appointments, say “where’s my phone “ more than twice a day, and/or only want to watch TV during my down time and so forth. That’s my brain not at its best. Instead I can skip the SPECT step and cut right to applying the knowledge inside Magnificent Mind. Kind of like how I can drive a car without building it, or use a computer without knowing how to code. My point is that if you feel foggy, disconnected, edgy, or anxious, or are having trouble sleeping, Magnificent Mind would be a great place to begin to help yourself feel better starting today. Or maybe it is someone else you want to help. It is important not to leave out brain health when you are looking for that solution to feeling better. Is it time for your brain to get a tune up? I promise it won’t hurt to learn how or do it. I recommend reading Magnificent Mind and of course, get in touch if you feel like you could use some more help. Share the post "Recommended Reading: Magnificent Mind at Any Age"